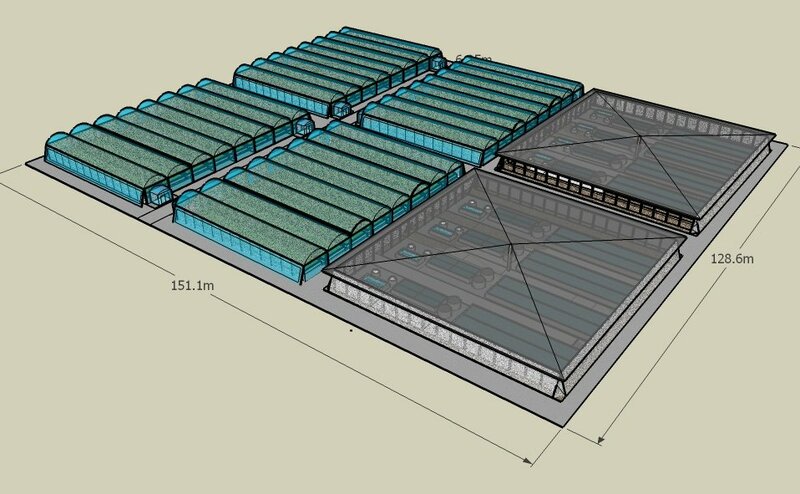 RAS aquafarming/aquaculture is, in my professional opinion, a reckless adventure with little potential for long term commercial application in aquaculture. There is a better way, so lets examine the reasons driving the gamble that is RAS and make some commercial sense of fish farming in tanks. The reason for RAS in the first place was to increase control over production. Unfortunately that purpose has never been achieved and certainly not from a commercial perspective, over time. One Barra farm in Australia claims to be the most successful, and utilise the most efficient filtration technology, however, on close inspection the farm uses pristine ground water at the exchange rate of up to 50% per day in a flow to waste system. Hardly RAS, would you think? I wonder how such systems fool EPA? Unfortunately, it is the glorious claims, so well cloaked in 'technology', associated with such deception that captures unaware investors. This particular farm has been in operation for over ten years and still only produces less than 50 tonnes per annum. Why? Such is the nature of RAS in much more than general terms. If you think that statement harsh just talk to any RAS investors. RAS systems, like the one mentioned above stand as glorious examples of how to manipulate government grant funding, supply the appearance of legitimate aquaculture which provides the successful facade by which such companies fleece investors. The POD RAS could better be called the C-POD design. Standing for Commercial Passive Orientated Design. To achieve these claims the design incorporates factors which retain the high density production of RAS however, and this is a fantastic point, to achieve consistent culture control the POD Design includes reliance on ponds and natural filtration techniques. The reason for this is simple. Pond water filtration reduces filtration costs to almost zero. This simple application of passive filtration reduces running costs dramatically. It reduces fish stress and results in high quality product. No other system can provide such stability in production and quality. POD RAS designs will always incorporate five distinct working areas to the Farm based around the above principle. Note: To date, no RAS production of coral trout has ever been carried out or even sent to small scale trial. The passive filtration system (POD PFS) works without labour involvement and staged pump requirements. The POD PFS utilises available site conditions as well as ponds and trenches. An extra flush to waste system has been incorporated where by the removal of ‘skimmed’ wastes can be passed over the parabolic filters and then removed to a natural sand filter and solids reclaimation system. It is visualized that a small backhoe be used in waste management and composting of faeces and other solids. You will note the lack of staff required to operate this RAS design. And it can be seen as to why. 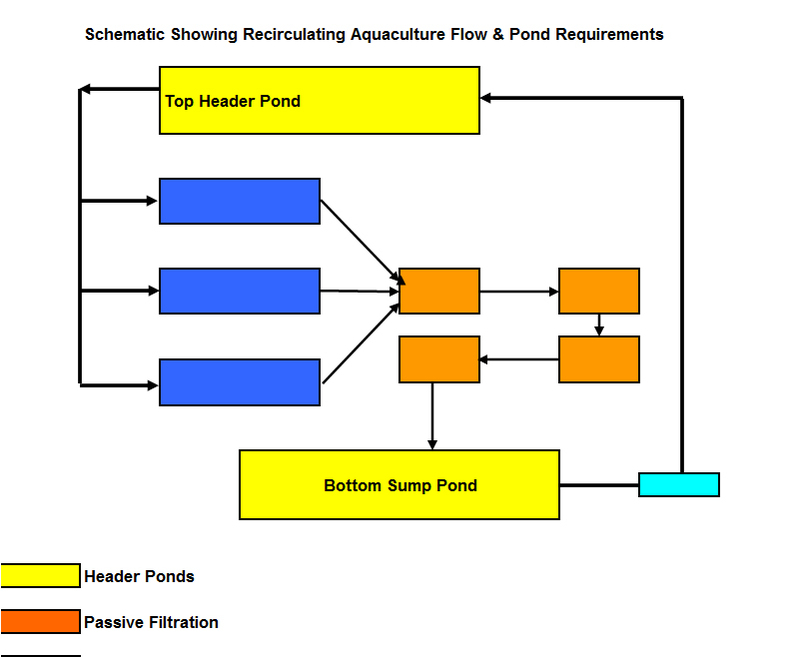 The farm design runs with mainly passive elements and gravity feed of water. 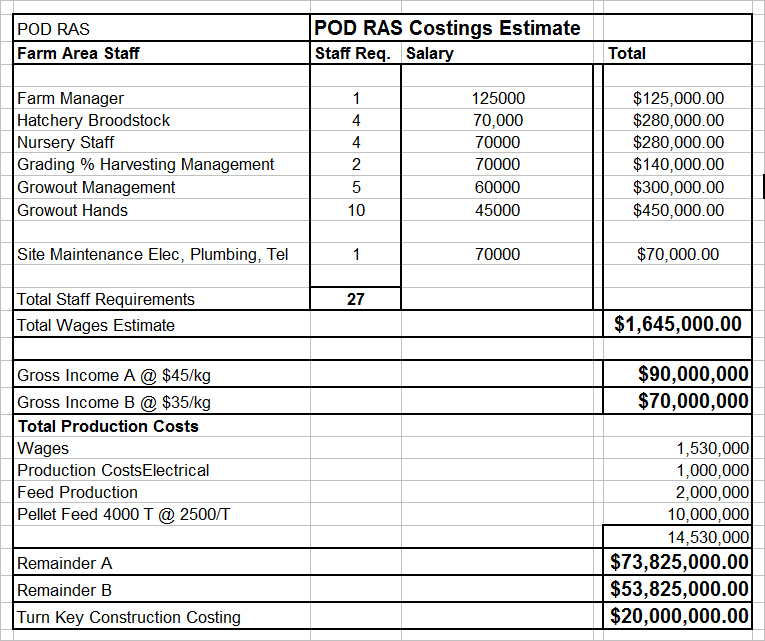 Efficiency longevity and automation are design essentials for this type of RAS. The SEV or site evaluation has many aspects as I am sure you can now appreciate. Aquafarmer's approach is to take a sketch book and calculator and walk the site several times, studying all aspects. It is at this time of mental assessment, many of the questions can be answered and many more are asked. Once the plan structure is clear, the potential risks and design problems can be imagined and managed. well before construction. Such imaging or visual presentation then allows reflection on design as a first edition draft. We utilise many pictures of aspect including underwater vision of the site and proceedm to evaluate the quality of all services and surrounding influences. Those completed sketch books make up the majority of the specific designs and give rise to the nature of the specific filtration as well as water- way implications of both input and disposal.